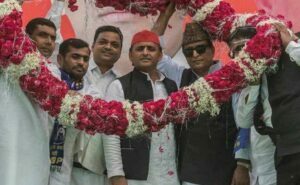 Courtesy: Azam Khan was with SP chief Akhilesh Yadav on stage when he made khaki underwear remarks. 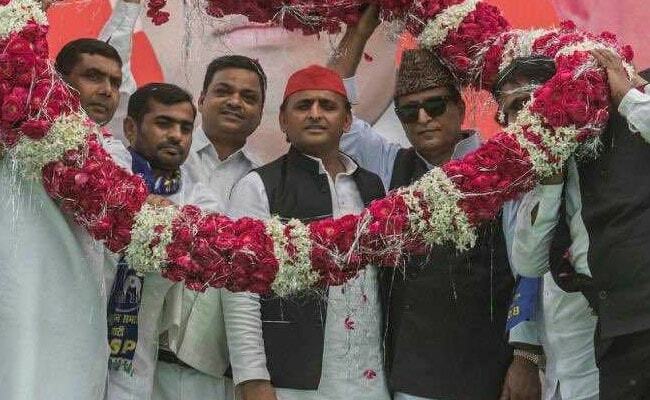 Samajwadi Party candidate Azam Khan, caught on camera making disgusting comments while rallying against his BJP rival Jaya Prada in Uttar Pradesh’s Rampur constituency, said today that he will not contest the elections if anyone can prove that he named the actor-turned-politician when he said …the underwear beneath is of the khakhi colour. I will not contest the polls if proven guilty…I haven’t named or insulted anyone and I know what I should say Azam Khan told news agency ANI on the crude remarks at an election rally on Sunday. I was a nine-time MLA from Rampur and have been a minister. I know what to say the SP leader said in a retreat following outrage and condemnation of his comments. The SP leader had said on Sunday…I want to ask you, should politics stoop so low? 10 years the person sucked the blood of Rampur , I held that person’s finger and brought the person to Rampur. I made her familiar with the streets of Rampur . I didn’t let anyone touch her. No dirty words were used. You made the person your representative for 10 years . But what is the difference between you and me. Rampur waalon , Hindustan waalon , uski asliyat samajhne main aapko 17 baras lag gaye (understanding the person’s real face you took 17 years). I realised in 17 days, that the underwear beneath is of the khakhi colour.” Azam Khan’s remarks were widely interpreted as targeted at Jaya Prada, who last week alleged that she left Rampur after her “indecent images” were circulated and attempts were made to attack her with acid. I told Mulayam Singh Ji that my indecent images are being circulated in Rampur, save me. But no politician tried to save me,” Jaya Prada claimed. She broke down alleging, I left Rampur and active politics because they tried to attack me with acid. Later composing herself, she continued: “For the first time, I have the strength of the BJP behind me. I don’t want to cry like before. I have the right to live, and I will, to serve you. The BJP and its ally Janata Dal United strongly criticised Azam Khan’s remarks. This type of language is unacceptable…using such words for women is shameful, we condemn this statement. Azam Khan should apologize,” demanded senior JD(U) leader Pawan Verma. Senior BJP leader and union minister Sushma Swaraj took to Twitter and drew an analogy from Mahabharata when Draupadi was being disrobed. She asked Mulayam Singh Yadav, founder of Samajwadi Party and former UP chief minister, not to make the “mistake” of staying silent just like Pitamah Bhishma, when Draupadi was disrobed by Duryodhana in Mahabharata. The National Commission for Women may take up the comments for action. “Absolutely disgraceful. Azam Khan is always abusive and disrespectful towards women. NCW will send a notice to him… will request the Election Commission to bar him from contesting elections,” said the panel’s chairperson Rekha Sharma. Jaya Prada had won the Rampur Lok Sabha seat in 2004 and 2009 on a Samajwadi Party ticket but later she was expelled for alleged anti-party activities in 2010. She joined the BJP last month. Her ties with Azam Khan, who had helped her in 2004, turned sour over the years, generating much bitter words and below-the-belt attacks. Uttar Pradesh is voting for the 80 Lok Sabha seats in all seven phases. Eight seats in the state went to polls in the first phase on April 11. Rampur is voting in the third phase along with several high profile constituencies including Moradabad, Firozabad, Mainpuri, Pilibhit, Badaun, Sambhal, Etah, Bareli and Aonla.